Among a dozen or so of us at school there was briefly a craze of taking squared school notebooks and pencilling in alternate squares like a chess board. One or two filled a whole book, page after page of grey and white squares - something that took a commitment of many days - but most achieved a handful of pages only. Progress was a slow and laborious, and its essential pointlessness somehow excited us and drove us on. 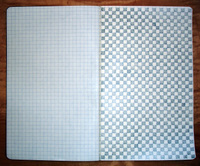 After we'd done a page or two the pencil would have worn nicely to a flat diagonal, optimal for quickly covering a square. We'd keep these pencils carefully in our pencil cases, reserving them for the notebook. But soon the teachers confiscated the books because they represented a waste of our time, particularly in the classroom, and of school material. The practice immediately went underground, but it was hard to keep up, and the checkerboard craze soon fizzled out. The image is a replica from last week, the original notebooks are sadly long-lost. See also: pixel portraits and Things Mag's 1160 found dots. "But soon the teachers confiscated the books because they represented a waste of our time"
mmm, so were you busy last week then? ps love the cirlces behind the blog. Wow - I had completely forgotten about that activity until you mentioned it. I don't believe there's a chance we were at the same school or anything - so this craze I think spread throughout the UK (or maybe just London).